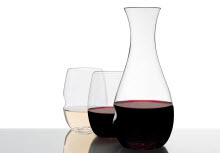 Members get free shipping when they order Govino's new dishwasher safe Decanter and Wine Glass set! Govino creates award-winning, dishwasher safe products from flexible, BPA free polymer that looks like fine glassware. Reusable and shatterproof, you can take your Govino decanter and glasses anywhere!